Dunkirk is the telling of one of the most historic battles of World War II on land, sea and air. Admit it. This summer was one of the most lackluster summers in a long time. Very few reasons to get people to come to the cinemas. Dunkirk, however, was one of the films that gave people one of the best reasons to go to the cinemas. One can see why. The film does share some minor similarities with Titanic. Firstly, it’s a film that features a lot of action as part of the story. This being about the Battle of Dunkirk and the evacuation would be a film that would feature a lot of action and a lot of intense drama. Also like Titanic, it features some fictional stories or story lines inside a moment of history. Like Titanic, they also include historical figures who were part of the Battle, however even there the depictions of incidents do stray away from what really happened and go for the story. Basically film is so loose, I’m okay with seeing a fictional depiction of moments in history as long as I’m made aware of its fiction. This film is a very good, very complex story of the Evacuation of Dunkirk. We should remember that the Battle Of Dunkirk was very important in the history of World War II. It was the first sign to the Allied forces that Hitler and the Nazi army had a vulnerable side and that the Nazis could be the losing side of World War II, despite how menacing Hitler and the German forces appeared. The rescue mission that accompanied it is a sign of the heroism as 300,000 Allied soldiers survived. The story focuses on three different aspects of the Battle– land, sea and air– and captures in the time frame of a week about what the heat of the moment must have been like for soldiers, civilians, casualties and leaders. The stories of what happened during the Battle of Dunkirk can be told through many different aspects and from many different viewpoints. This film succeeds in capturing the moments as the tension begins, the battles ensue, the devastation is done, the rescue has its own friction and the eventual triumph happens. It allows the viewer to relive the moment of all that happened. I even remember for a brief period of time that I thought the Allied soldiers would lose. Of course I learned in history that they did not lose, but the film succeeded in making me forget it sense that they might lose. That’s the magic of film. The film is not just about giving a moment in history three different sub-plots. The film also captures the human element of the battle for those part of it. Although the characters are fictitious, they are based on real people from the Battle Of Dunkirk. First there’s young Tommy who goes from being the sole survivor of a battle to joining two other Allied survivors in a new fight for survival and shelter. There are the Dawsons who find themselves rescuing a shell-shocked soldier and seeing their friend George die because of his violent reactions. There’s the RAF pilot who goes from one one of the following pilot to leader of the battle as his leader is shot down. All three stories may not be exact true stories, but they capture the human side of the battle. In all three scenarios, it’s the story about surviving right as they’re witnessing death and destruction around them. It’s likely that what we see in the stories of Dunkirk are similar stories that thousands faced during the very battle. It’s even a reminder of why we should look at those who were part of the Battle, both soldiers and civilian participants, as heroes. This film is arguably writer/director Christopher Nolan’s best film to date. He came across the idea of doing this film in the 1990’s as he and his wife sailed across the English Channel along the same path of the Dunkirk evacuation. This was no easy film to make. He had his concept of three different scenarios of the Battle Of Dunkirk. He not only had to give the human element to his stories, but also include the action of the battles and the intensity of the various moments. He did an excellent job of constructing such a story that was not only well-done and well-pieced, but was also able to engage the audience as well. As for the acting, there was not a single stand-out role. Nolan even admitted he didn’t want to put emphasis on the characters for who they are, but instead on will they survive this. Even the role of Tommy was kept very minimal, but Fionn Whitehead did a very good job in his performance as the young soldier struggling to survive. I believe the best acting performance came from Mark Rylance as Peter the mariner who’s caught in the intense situation, but tries to remain cool and calm. Another standout is Tom Hardy as the Spitfire pilot who’s thrown into the leadership role. I know some that are loyal to One Direction may take interest in this because of the appearance of Harry Styles. His performance is good, but his role is limited. The film needed to have top technical efforts in order to be successful and it had some of the best of the year. There was cinematographer Hoyte Van Hoytema who delivered excellent camera angles,editor Lee Smith who was able to piece the three stories together very well, production designers Nathan Crowley and Gary Fettis who did an excellent job of constructing seaside Europe in 1940, composer Hans Zimmer who delivered yet another score that fits the movie to a tee, and the visual effects team for recreating the battles and attacks that occurred. On an Oscars note, the craziest thing about the months before December is that one does not know which films will have enough juice to qualify for a Best Picture nomination. It’s become very obvious in the last few decades that the big studios save the release for their ‘Oscar bait’ movies for December because they know how things work. Most of the time, a lot of excellent movies that get released in the summer or earlier often miss getting nominated for Best Picture. The year when it was best made obvious was 2002 when all five Best Picture nominees were films either released in December or given wide release in the New Year. Winning an Oscar or even getting nominated is as much about studios doing a strategy or ‘playing the game’ as it is about doing an excellent effort. Don’t forget this is showbiz. Even awards of merit like the Oscars, guild awards or even critics circle awards need to be campaigned and marketed for the win. Dunkirk is not just a simple re-enactment of one of the first major battles of World War II. It delivers in the human side of the story as it delivers in the action of the battles. This explains why while the summer movie season of 2017 was known for being lackluster, this movie was a top highlight. And a top-quality highlight too. Here I am back to my blogging habit. Yes, I have quite the backlog in terms of movie reviews. I have the energy to post now and I’m able to post a double review of two of the hottest movies of the summer: Jurassic World and Mad Max: Fury Road. Both were either sequels or part of a franchise. Both cost $150 million each to make. Both are different in terms of the audience they can win over and both have differing success results. Tom Hardy (left) and Charlize Theron fight for survival together in a post-apocalyptic world in Mad Max: Fury Road. Yes, it’s been a long time since there’s been a Mad Max movie: 30 years to be exact. George Miller is back in directing this Mad Max movie, or picking up where he left off as one could assume. And believe me this movie was quite something else. Right at the beginning you’re left wondering what kind of world this is. The world is a complete bizarre wasteland and the whole universe in existence is fighting each other and Max. Mind you even the bad guys are insane enough that Joe uses Max as a universal blood donor and has five wives for the sake of breeding purposes. Over time, some of the people become Max’s friend in order to save civilization from Joe. Already that’s a lot of craziness most fans of the original three Mad Max movies would find hard to fathom but watching the movie even gives it enough craziness for any movie viewer hard to fathom. Even the people all act like they’re all on something–crack, smack, speed–and it’s not just the bad guys. Just one insane place full of insane people. However what would have to make people adjust to this new version of the Max Max franchise would have to be good characters. First would have to be Furiosa. Right in the middle of the movie, you could see the pain in which she’s going through. It’s also a pain shared by the other four wives of Joe. Once these characters were made more human, it made for something for people to connect to the story. In addition is the connection of the character Nux. Nux was very unhuman but his human side was more noticeable later on and it gave cause for people to feel for him even as he sacrifices himself. The character work couldn’t have been done firstly without Charlize Theron as Furiosa. It’s her performance that made people feel the pain of Furiosa. There’s even talk of Oscar buzz for Charlize this early. Nicholas Hoult’s performance help turn a beast of a character like Nux into a character with dimension and actually makes the audience feel for him. 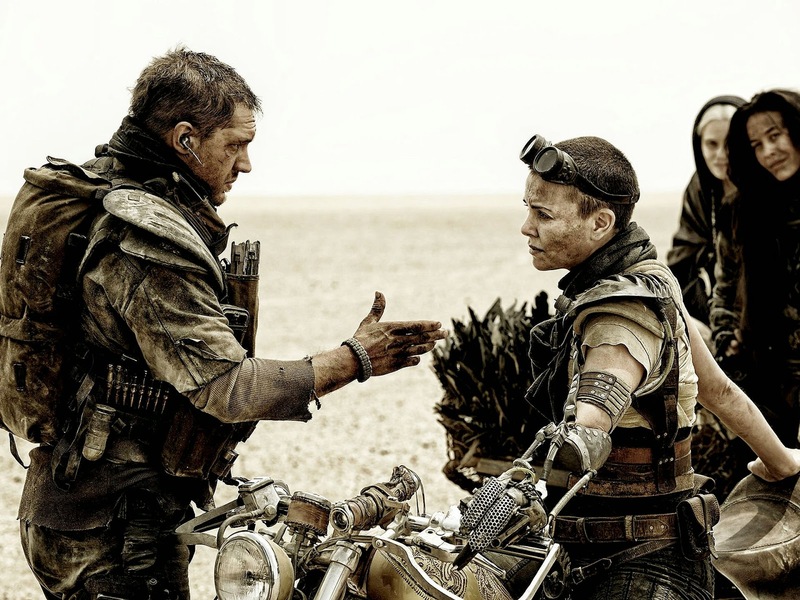 Tom Hardy did a good job as Max Rockatansky. I’m sure in this film he had the duty to try to fill Mel Gibson’s shoes. I don’t know if he did it but he did a good job as Max. George Miller did a good job not just in directing the movie and co-writing the script with two additional writers. He also created the bizarre world in which Mad Max and his allies had to survive in and fight for their freedom. Also instrumental in creating this bizarre world are the set designers, costumers and the visual effects team. The music from Junkie XL also adds to the drama and the insanity of the movie. Of the $150 million Mad Max: Fury Road cost to make and produce, it has so far made $152.6 million in North America and $368.6 million worldwide. Not huge spectacular numbers as far as summer movie fare goes but pleasant enough for a sequel– Mad Max The Wasteland— planned for either 2017 or 2018. It has even impressed critics that it received 98% on Rotten Tomatoes. Who says all summer movies are money-grabbing junk? Mad Max: Fury Road may not be exactly the type of movie most would expect, not even fans of the original Mad Max movies, but it exceeds the expectations of whatever you throw at it. I know for me it didn’t appear at all like what I normally expect from a sequel. And many of you already know what I feel about Hollywood sequels. I don’t even think this is even a sequel. Mad Max may just be a franchise instead of a chronological series. Nevertheless it’s way better than most common summer fare. Jurassic World is about the latest Jurassic theme park where chaos will undoubtedly ensue any minute. Already you know a movie like Jurassic World will be a hit simply because of the title. This is the few times where judging a book by its cover is legit. Whether the movie is all that great remains to be seen. The film doesn’t really carry on the tradition of the Jurassic Park book of Michael Crichton. Instead it’s a new story concocted by Rick Jaffa and Amanda Silver and adapted to screen by Jaffa and Silver along with Derek Connolly and Colin Trevorrow who directs the movie. What happens is Jurassic Park is long defunked especially after the fatalities. The writers and directors create a story in a new park, Jurassic World. 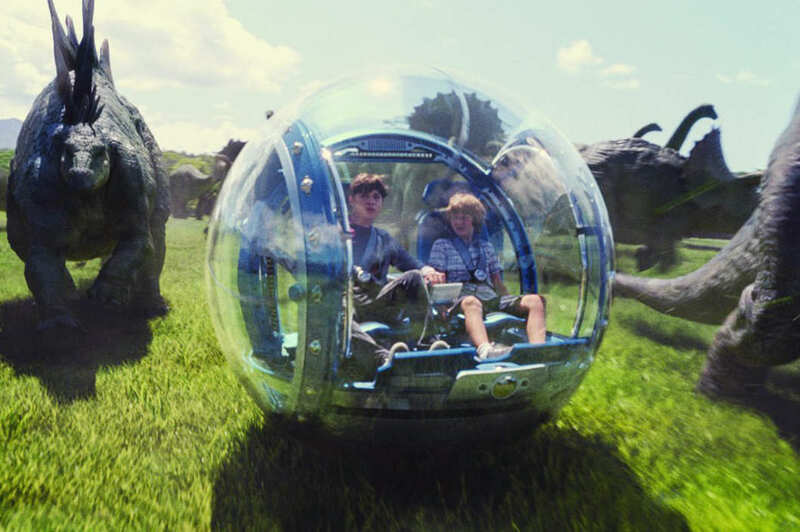 Jurassic World is a theme park that`s a whole island that includes exhibits that make it both a museum and like one of those safari parks one can drive through. Clever work for a popcorn movie but over time, you feel the story is as simplistic as one would expect from a Hollywood story. A park worker is a woman out of love while looking after her about-to-be-divorced sister`s kids and dealing with the dinosaur trainee whom she finds charming but had a flop first date with. Sometimes it seems as though the characters seem too simplistic as well: Owen as the charming but stuffy trainer, Claire as the out-of-love-and-depressed type, Vic as the slacker security operations person, Grey as the cute kid with sad puppy dog eye and his bother Zach as the typical bored miserable teen who somehow gets cheered up by the dinosaurs. Even the drama becomes a bit predictable over time. You sense there would have to be some sort of havoc at the World to get the story rolling. Sure enough, the escape of Indominus is what starts the drama. You have to admit it was a tad predictable. Even how the two boys become threatened in the ensuing drama is predictable too. I will admit the one unpredictable thing was when Indominus breaks into the park`s pterosaur aviary and has them all on the loose chasing all the other park visitors. I did not expect that nor did I expect the whole Jurassic World to look like a war zone at the end. I give that credit. Overall, Jurassic World came across as a common popcorn movie where a lot of the excitement was either missing or anticipated right from the start. It`s a movie that appears undecided whether it wants to be charming or a thriller. I kind of blame it on the lack of Spilberg magic that came with the first Jurassic Park movie. I also kind of blame it on some of the character acting that appears so stocky like Bryce Dallas Howard playing another unlucky in love type, Vincent D`Onofrio playing an all-to-common slacker player and Ty Simpkins playing a typical cute kid with sad puppy dog eyes. The one good performance although in a typical popcorn movie character was from Chris Pratt. He was able to make his character of Owen Grady charming and even a bit charismatic. I also give credit to the set design team for creating this island where Jurassic World is situated on and credit to the visual effects team for delivering top notch visual effects and even delivering some thrills to the movie. Although I said the action was mostly predictable, it did deliver in some thrills. All-Time Opening Weekend: $208.8 million. That`s just a sample of the records Jurassic World broke. I`m sure you`ll find more at Box Office Mojo. I don`t think it will break the all-time gross records especially as it finds itself out of the Top 10 in its ninth week. It may eclipse Titanic as the second-highest grossing movie in North America but it would still need at least $100 million more to contend to beat Avatar`s record. Sure enough, there will be a Jurassic World sequel. It`s not clear if Trevorrow will return as director but he will write and produce it. Bizarre because if the Jurassic World wreaked that much havoc on that many visitors, you`d figure Jurassic World would mark the absolute end of any Jurassic theme parks. Hey, money talks especially in Tinseltown. Jurassic World and Mad Max: Fury Road were two of the big movies of the summer of 2015. One didn`t do as well as expected while one was a record-breaker. One had a better story and better character than the other. Both gave a good statement of what the summer movie season of 2015 was like.